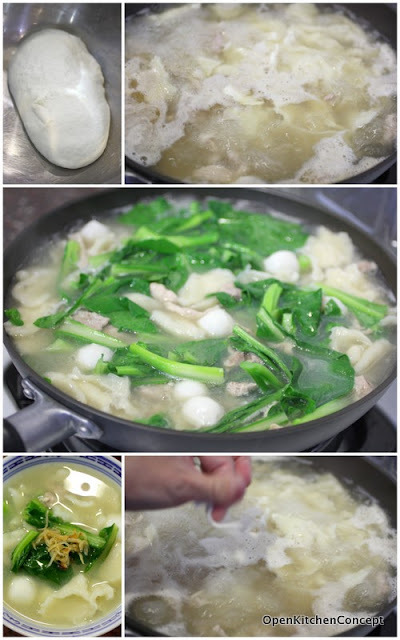 Mee Hoon Kueh (面粉馃, or literally translated as Flour Cake) is a type of flat noodles, usually served with meat and vegetables in an anchovy-based soup. To me, authentic homemade Mee Hoon Kueh has to eggless and should be shaped/ pulled by hand. Today, you can easily find Mee Hoon Kueh in most food courts around Singapore, but they invariably make them with eggs in the dough and roll the noodles out using machines and then cut them out too neatly for my likely. Homemade Mee Hoon Kueh is a comfort food for me. The taste is rustic, simple, yet delicious. Somehow, my mum's version of Mee Hoon Kueh is the best I've ever tasted - the noodles are chewy yet smooth and the soup light and savoury soup, full of the taste of anchovies. She doesn't add too many ingredients in the soup - just fishball, some chicken and lots of vegetables. Mushrooms are usually left out because they tend to overpower the taste of anchovies. My grandmother used to make them often when I was younger and she would usually give me a bit of the dough to make creations of my own. I'd usually make a bear or doll out of the dough and then play with my "Mee Hoon Kueh" toy for the rest of the evening. Food with childhood memories are the best kind of comfort food. My mum's Mee Hoon Kueh - yummy! I have to learn this from her.. I LOVE home-made mee hook kueh!!! BUt Im too lazy to make my own. Luckily I have a neighbor who cooks home-made MHK once a while and I get to enjoy! Hurray for good neighbors!